Light version for kids. Also, you can try more difficult versionwith more parts in my store.Do you like to assemble puzzles? Thentry to assemble a real old tractor! Some of them are dead, somework today. 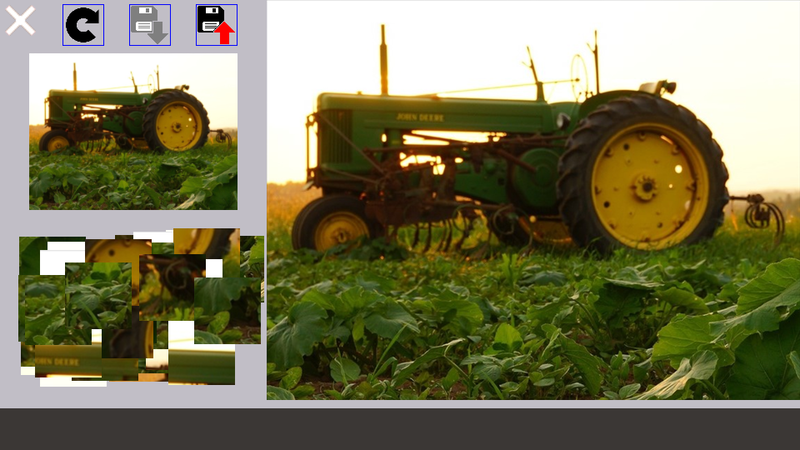 In this game you have to create pictures of realtractors from a lot of individual mixed parts of the whole picture.To change the prototype picture, move it to the right or to theleft. If it is difficult to assemble - use a hint. Push and holdthe prototype picture and see the contours of the assembled pictureon the working field. Look for suitable parts, put them in theright place and everything will turn out! Playing puzzles developsimagination, attention and logical thinking. 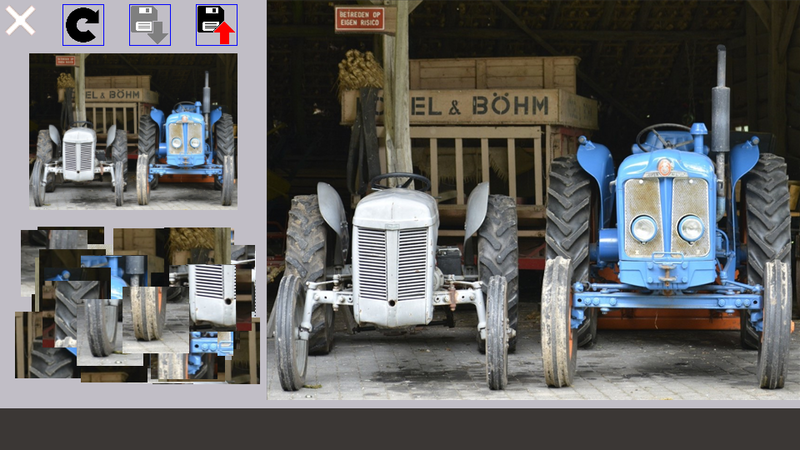 Try to assemble all 39old tractors!P.S.Thanks to the authors of photos. All photos ofCC0.Light version for kids. Also, you can try more difficultversion with more parts in my store.Do you like to assemblepuzzles? Then try to assemble a real old tractor! Some of them aredead, some work today. 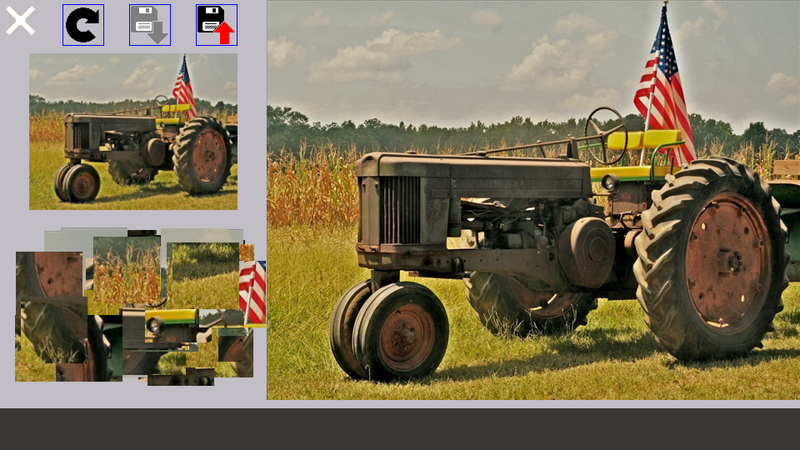 In this game you have to createpictures of real tractors from a lot of individual mixed parts ofthe whole picture. To change the prototype picture, move it tothe right or to the left. If it is difficult to assemble - use ahint. Push and hold the prototype picture and see the contours ofthe assembled picture on the working field. Look for suitableparts, put them in the right place and everything will turnout! Playing puzzles develops imagination, attention andlogical thinking. 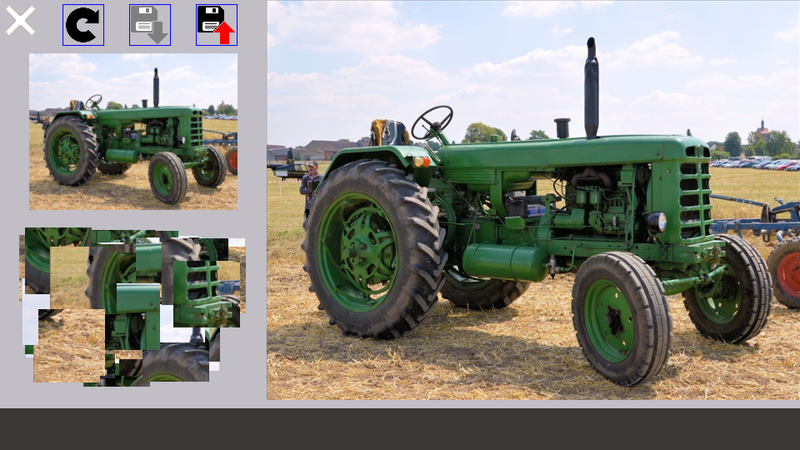 Try to assemble all 39 old tractors!P.S.Thanks tothe authors of photos. All photos of CC0. A logical game in which you create shapes using 7 separateelements. All items must be involved. Added hints for pictures1-100. Press and hold "?" For pictures 1-100. For more accuratepositioning of elements, their rotation and reflection, use thebuttons on the left side. There are no blocked levels. You canassemble any picture. This app is designed for those who need to quickly choose thedesired color from the colors that are available. The program isintuitive and allows you to get first on the screen the desiredcolor before mixing real paint. It will be clear to the user whatcolors and in what proportion will be required for the result. Canbe obtained separately, first one color, then another and finallyanother and mix them together.This application is based on viewmodel CMYK color and clearly explains:1. As with just three basiccolors - C (Cyan), M (Magenta) and Y (Yellow) mix them you cancreate any other color on a white surface.2. What color do you getif you mix the two previously obtained by mixing colors.3. Whatcombination of primary colors needed to obtain all seven colors ofthe rainbow.The application will help not only in the selectioncolor in painting, but also give a clear explanation of why whenprinting color photo on a white surface, it is sufficient to useonly dots of Cyan, Magenta and Yellow (with a sufficient increasein the printed color image shows that the image consists of colordots of three colors). For create a contrast image adds blackpaint. Do you know how your computer is able to do different colors on thescreen using just three basic colours? As heroes of your favoritecartoons on a computer screen look just like in the movies? Maybeyou know how to draw and want to know how to make a new color ofpaint? Find out how to do it! Puzzle game where you make shapes using the individual elements.All items must be involved. In this game used images of figuresscanned from the original game instruction from the USSR of the80's. For more accurate positioning of elements, their rotation andreflection, use the buttons on the left side. There are no blockedlevels. You can assemble any picture. Touch and rotate! Forget everything that is annoying! This toy isantistress! It can continue to rotate for quite some time and havereal vibration. You can change the image of spinners and addphysical effect. Be happy! Version of 48 parts. Also, you can try a lighter version for kidswith fewer parts in my store. Do you like to assemble puzzles? Thentry to assemble a real steam locomotive! In this game you have tocreate pictures of real historical steam locomotives from a lot ofindividual mixed parts of the whole picture. To change theprototype picture, move it to the right or to the left. If it isdifficult to assemble - use a hint. Push and hold the prototypepicture and see the contours of the assembled picture on theworking field. Look for suitable parts, put them in the right placeand everything will turn out! Playing puzzles develops imagination,attention and logical thinking. Try to assemble all 39 first-classlocomotives! There are no blocked levels. You can assemble anypicture. P.S. Thanks to the authors of photos. All photos of CC0. Version of 48 parts. Also, you can try a lighter version for kidswith fewer parts in my store.Do you like to assemble puzzles? Thentry to assemble a real fortress! In this game you have to createpictures of real fortresses from a lot of individual mixed parts ofthe whole picture. To change the prototype picture, move it to theright or to the left. If it is difficult to assemble - use a hint.Push and hold the prototype picture and see the contours of theassembled picture on the working field. Look for suitable parts,put them in the right place and everything will turn out! Playingpuzzles develops imagination, attention and logical thinking. Tryto assemble all 39 fortresses!There are no blocked levels. You canassemble any picture.P.S.Thanks to the authors of photos. Allphotos of CC0. The goal of this puzzle game is to set up mirrors so all lightsbulbs become turned on. You have for this different types ofmirrored surfaces which reflect laser beams in different ways.LASER PUZZLE FEATURES: • 300+ levels of varying complexity. •Square and hexagon game fields. • Various mirrors for controllingthe laser beam. • Contains set of levels designed especially forkids. • Beautiful and simple UI. • Intuitive gameplay. • 8different color palettes. • Hint system. • No time limit. Thislogic puzzle promote your problem-solving skills, which helps keepyour mind sharp as you think about how to set up mirrors to lightup all light bulbs. Move mirrors, reflect the laser, light up alllamps! No Ads. Clean design without complicated settings. Just selectpuzzle and start solving! It offers more than 60 different puzzlesin three difficulties. The task is to place light bulbs in whitecells to illuminate the entire board. Complete rules are in theapplication. Akari Puzzle (Light Up) requires internet for sendinganonymous crash reports. It helps us to improve future versions. ■[Game introduction]■Make the path by moving blocks. If pathconnected, then cube will roll and click the switch of light.Do youthink you could make all of light turned on?Star Mode that collectsstars above blocks and Move Mode that turns on the light inattempts are ready for you. Logic Puzzle Game Tractor John Deere like absolutely everyone wholoves technology, ships and planes, cars and trains, all modern andnot very achievements of scientific and technical progress. Youlove technology, automobiles, transport - is an application createdby us especially for you, the fans! In the application, you willnot find built-in shopping, all free of charge, to anyone andeveryone! Just download this Puzzle Jigsaw Game on your phone andtablet, and enjoy the amazingly beautiful puzzles, any collectedimage can be saved to your device and use as wallpaper!Enjoywelcome your feedback and ratings! Can you light up these puzzles?Lightup, also known as Akari, is alogic puzzle game played on a grid of cells. You must use numberedcells as clues and try to light up all the cells by placing lightbulbs in their correct positions. The numbers on cells indicate howmany light bulbs they must be surrounded by.Although someexperienced puzzle game players may already be familiar withLightup and how it is played, there are probably more people whoare unfamiliar with the game. E7 Lightup was designed specificallyso that beginners can download the app and quickly learn all therules and strategies of thegame!-------------------------------------------------------Rules1.Every cell must be lit.2. The numbers show how many light bulbssurround that cell.3. Light bulbs cannot light eachother.-------------------------------------------------------E7Lightup features...• A tutorial mode featuring 40 stages thatguides players through every step on how to solve each puzzleefficiently.• 3 basic difficulty levels(Easy, Normal, Hard)• 30different puzzles for each difficulty• Constant hints and remindersthat help players who are stuck• In-app purchase options for evenmore game packs including bigger puzzles as well as Expert andMaster difficulties• 940 puzzles available in totalDownload E7Lightup and try to solve and light every puzzle! Our game Puzzle JCB Tractors New Best is created for all lovers offascinating logic games, fascinating puzzles and unique images! Inthis game you will find a lot of beautiful themed pictures, chosenespecially for you, from which you can collect fascinating andunforgettable puzzles!Thanks to the convenient and intuitivecontrol of any puzzle you can collect in one click. With the helpof the convenient Gallery you can choose the picture you like andsave it for memory or online (DropBox, iCloud, Google Drive),present it to friends or publish on your social networking pagesuch as Facebook, Twitter, VC and others.Especially for you thegame is free and does not contain in-game purchases! Develop logicand thinking, try our other games and puzzles from a series ofParks Entertainment, Water Parks, Sports Games, Sports,Competitions, Dog Breeds, Motorsport, Motorsports, Cool Cars,Sports Cars, Tractors, Trucks, Aviation, Aircraft, Nature, Colorsand many other fascinating subjects! Gadget Software Development and Research LLC. Trucks and cars puzzles for toddlers! 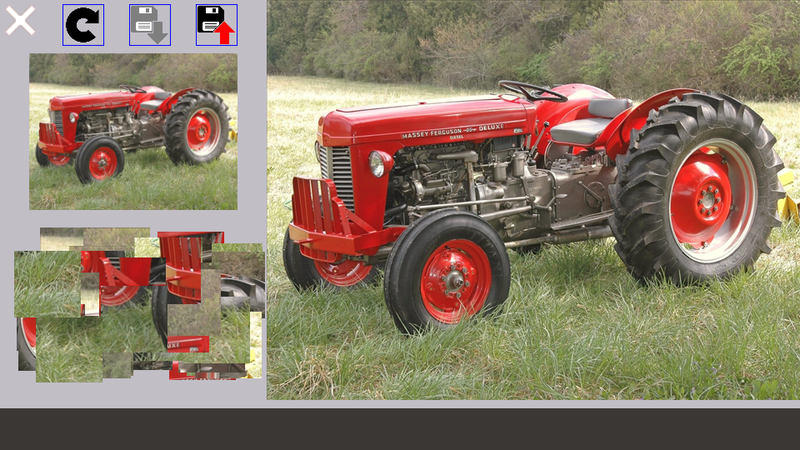 Tractor puzzles for toddlersMore than 100 animated jigsaw puzzles for kids! Put together apuzzle to see cars going, construction machinery moving. All jigsawpuzles are colorful real world pictures. They help toddlers explorethe world around them and learn to distinguish different objectgroups. The game helps children memorize different elements ofsurrounding objects, develops attention and brings many hours offun. Specially for boys there are new games free 2016 for kids withmachinery, cars, trucks, trains in the game. Little admirers ofconstruction machinery are definitely going to like digger puzzlesfor toddlers, dozer and of course children’s favorite vehicles –ambulance, fire truck and police car. Themes of big truck puzzlegames: - Construction Machinery. Puzzle for boy full of heavymachinery used on a construction site! You'll find here: roller,cement truck, mixer, dozer, tractor,dump truck games for toddlers,digger, excavator, caterpillar, earthmover, dumper, bulldozer,crawler, scraper. - Special Purpose Vehicles. If the child likes toplay policemen or firefighters then these puzzles are right forthem! Here kids can assemble police car, fire truck puzzlestoddlers, ambulance car and also taxi and even a SWAT car! -Ships-Planes-Trains. Jigsaw puzzles for kids who love to explore!Travel around the world on a sailboat, yacht; by tram, plane, trainor take an air-balloon flight or blimp. ship jig saw puzzles freeCheck out our other apps for more new jigsaws sets: Cars,Auto-Moto-Bikes, Trucks and Buses, Animals, Living Creatures,Plants, Sea Animals, Sights, Houses. The FULL VERSION includes 15categories with more than 100 jigsaw puzzles. Both boys and girlswill like our addicting games. Children can pop balloons when apuzzle is completed and get a wonderful collectors’ vehicle for 5completed puzzles! At the same time a child will have much fununwrapping the present which is placed on his personal prize shelf.Amass a big collection of presents on the personal prize shelf.Game features of best kids games for 5 year olds free: - Originalhigh quality cartoon puzzle images of vehicles and police carpuzzle game drawn by professionals - Choose images to complete froma wide collection of themes with multiple colorful jigsaw puzzlesin each of them - Interface and touch control are speciallydesigned for toddlers and preschool children - Nice animations andsounds while assembling a cartoon puzzle bulldozer puzzle to playand learn - Animations make the vehicles come to life - Easynavigation between categories and cartoon puzzles with excavatorgames for kids free - Easy movement of puzzle pieces across thescreen for children of kindergarten age - Development of comparisonand fine motor skills, hand-eye coordination, visual perception,leadership - Drag and drop puzzle pieces to match their holes -Kids get to know vehicles and just enjoy the game! Young explorerswill surely love to collect their favorite car pictures from trainsfor little toddlers to digger games for kids free. - Ambulancefiretruck and police car game for kids These educational games arealso designed for 2-3 year old children to develop their firstcomparison skills, recognize numbers, find out about vehicles,learn animals, food, plants, and simply enjoy the games. All gamesare easy to use for little kids: preschoolers, toddlers, littleboys and little girls.